I had the opportunity recently to visit Arizona and take in some incredible natural beauty. The desert in the south of the state is different from the desert in the north. This render takes a bit from all of the different regions I visited, and adds a healthy dose of my own fancy. The landforms were modeled using World Machine and are the first such efforts to appear in my gallery. 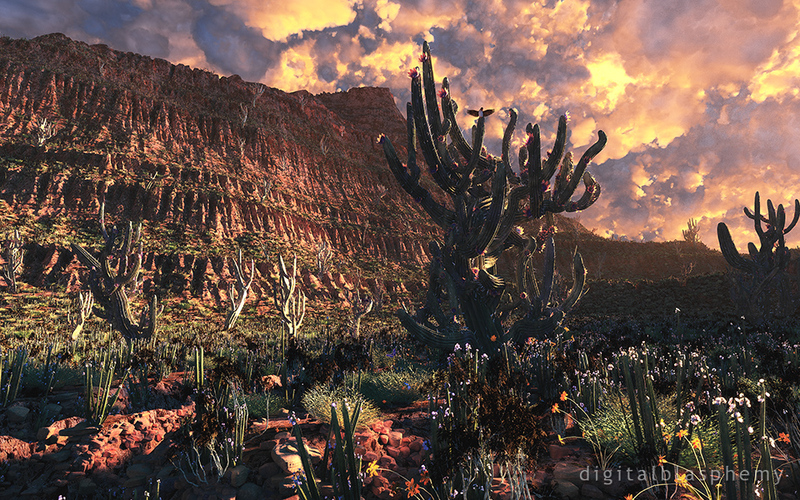 Likewise, the cacti are my first original efforts modeled using "The Plant Factory". They appear at different levels-of-detail throughout the scene. There are quite a few things I would like to change about this scene but I thought it looked nice enough to share as is and it has been too long since I've been able to update my gallery. Just rendering at 4K took nearly 72 hours! As soon as this image is posted I will be shutting down Bucephalus, installing my new GTX 980 and swapping out my old Dell 3007 for as many of my new BenQ 4K panels as I can get to run. I hope to have the rest of Shadowfax assembled and in action within a week or so. Wow! So much of what Sonora reminds me of on just one picture. Please!!! When will the multi-screen version be available??? I keep checking for this in multi-screen, hoping that now that the powerhouse rendering machine exists, this will get done... Any timetable? Also hoping this one moves up the queue for multi-screen version. This is such a unique piece of your landscape wallpapers that it deserves an equal place with the other 2015 renders. Very nice. Reminds me of west Texas and Arizona; both of which are favorites of mine. I recommend losing the scattered saguaros on the cliff wall. Just let the cliff be. I think I've figured out a way to finally render this without it taking weeks. Stay tuned! This is one of my favorites of yours. Would love a dual screen version. "Really like it, but need 5K!" @Ryan: I like this one a lot, but I'm really missing the 5K render that you lost. There's so much detail in this image that it'd really benefit from the 5K version. Would you please set it going again so that we can actually have the image at that size...? I really like the desert details. I like the desert anyway, but this is just pleasant, and the colors are calming to me. Where is the iPhone 6 render? Thank you very much for continuing to offer 16:10 aspect ratios. It makes sense that you're not going to offer 4K or 5K versions, but I'm really happy to hear that 1920x1200 will still be on your list. I will still offer 16:10 renders, but it doesn't really make sense to offer 4K/5K versions (or render them) when no screen will ever use them. I will still provide the lower resolutions though. I love this piece - on large screens (I'm running it at 2560 x 1600, so I also hope you don't stop 16:10 renders) it just 'feels' like a deep image - my eyes immediately relax when I flip to that desktop and I feel like i'm looking out a window - at a slightly wonderland version of the Colorado Foothills where I live - Kudos to you indeed Ryan - a great image! As a user of many, many 16:10 monitors, I hope that you keep making renders in that aspect ratio. Ultimately, though, your decision. As usual a fine render. My only quibble is w/ the bird. The bird itself is fine, but the placement in/on the image is frankly just wrong. Based on what I see the bird is a full image (wings, body, head, feet, etc.). It looks to be "placed" on the almost tip / side of the cactus, much like the flowers are. Thus making the bird look like it's resting it's behind on the cactus or it's impaled by a thorn (in that same area). IMHO, the tip of the cactus should be in front of the bird, and the bird should be slightly higher with its feet just coming to rest on the back side of that cactus arm. Conclusion, it's just not natural looking. Most birds "rest" on their feet, as well as land on and take off from. 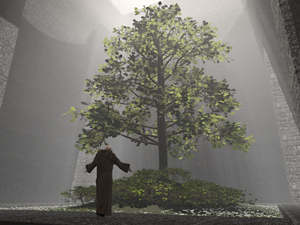 Otherwise, another fine image, especially in the smaller renders. Another Tucsonan here - I have to laugh because my base reaction was "the colors are right and I can see that as a fanciful take on the native cacti, but we never have that kind of complete cloud cover with those colors at sunset - if you are getting the golden hues there have to be spots of clear sky for it to shine through". The overall color and representation of the life in the desert is caught quite well. The cacti, however, look to be from a strange world. I am not sure if that is what you're going for or the impression you had of them during your visit. I know that in many of your landscapes, it is a view of a different world so wasn't sure what you went for here: accuracy with some poetic license or another planet's desert. Overall, I do like the image, but not crazy about the oddity and top-heaviness of the mature cactus in the foreground. With the torrential rains and often-times crazy winds we get here, that one wouldn't last long in life. I will be watching for the multi-monitor renders, and hoping for less predominance of the "odd" ones. Don't worry that I'm going to stop posting 16:10. I will continue to provide those resolutions! However, when I create the images I will be framing them first for 16:9 and then adapting those renders for 16:10 somehow. Wow. I really love this image! I'm from southern AZ myself. It's funny, when other people hear "desert" they tend to think "dead" and it's not. This is so representative of the desert teeming with new life. Amazingly well done! I've been a fan of yours since 1999. I just took up vector drawing, and it's a little complicated, but I'm muddling through. Then there you are, no warning, just BOOM, there's another glorious piece you just sort of offhandedly banged out. Good job again. You nailed it. I'm another old desert rat who loves this piece. It captures the magnificent expanse and solitude of the Sonoran. Nice, I like this, but I hope this doesn't mean that your dropping 16:10 entirely, as I still run duel 1920x1200 monitors, and soon to get a 3rd for some surround gaming. This is almost exactly what the desert looks like right after it rains. I live in Tucson and was thrilled to find this. I LOVE this! Thank you! I wouldn't be surprised if this becomes one of your top 10 rated pieces when finished. Improvements? The sky is not on the same level as the rest. What happened to the Eclipse WIP wallpaper? This one came out of nowhere. It is nice though. I live in Phoenix, so that's a familiar scene. A few more flowers than what I'm used to but the rest is spot on. Beautiful work!